Why not check out what the ultimate Valentine's gift could look like? Or see what happened when we took to the streets of London with a gigantic bouquet of flowers. Valentine's Day is all about love and romance and at Arena Flowers we have a wonderful selection of beautiful Valentine's Day flowers and gifts to help you sweep your loved one off their feet! 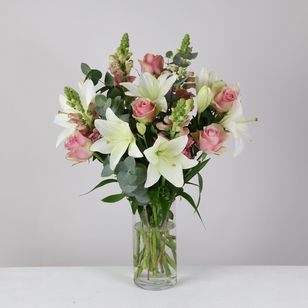 On this most romantic day of the year you can choose a simple bouquet with a loving message or you can be wildly extravagant and choose a large bouquet with champagne, chocolates or cuddly toys to accompany your romantic message. Whatever you choose, our Valentine's Day flowers are the perfect way to make this a truly unforgettable occasion of pure romance. Click here to send flowers abroad for Valentine's Day. See what happened when we took to the streets with a giant bouquet of roses!